What better way to shrug off the winter blues than with a vibrant pop of colour? 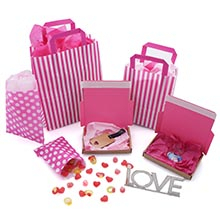 Here at ukpackaging.com, we have introduced several new lines of vivid retail and ecommerce products to cover all of your packaging needs, from tissue paper and coloured bubble wrap, to postal boxes, bubble envelopes, bubble bags, and colourful paper bags, we are adding colour to every step of the packaging process. Given that it is the season of love, we decided that the best way to celebrate our colourful new additions, was to create a visually stunning display of love! These stunning shots take full advantage of the gorgeous aesthetics provided by our Pink Postal Boxes, and Coloured Tissue Paper, alongside our new paper bags. 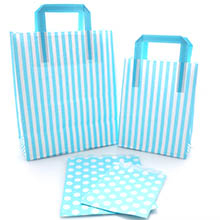 We offer our new Paper Bags in two styles, Tape Handle Carrier Bags, and Counter Bags. 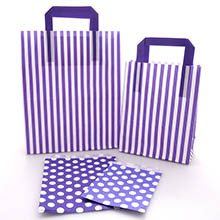 Our Striped Tape Handle Carriers are available in three colours; Pink, Purple, and Blue, and are also available in two sizes, 7x9, and 10x12. 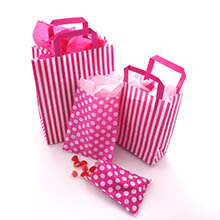 Each bag has a gusset and a block bottom for additional stability, making these perfect for gifting and retail, or to add a burst of colour to restaurant and take away bags. 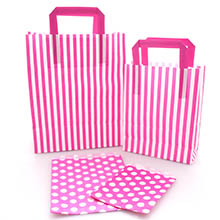 Meanwhile, our Polka Dot Counter Bags, are also available in Pink, Purple, and Blue, and are perfectly sized for sweet shops, or craft and market stalls. These bags are also available in two sizes, 5x7" for smaller items, and 7x9" for larger. Both of our Paper Bag ranges are stunning, but together, they guarantee a truly eye-catching display, we think they make a bright and brilliant addition to our Retail and Environmentally Friendly product ranges. 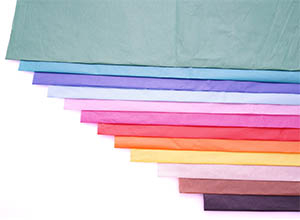 Our new Coloured Tissue Paper is available in a wide range of 12 striking colours, including the Pale Pink and Cerise shown above, and is perfect for adding protection when presentation is key. These sheets are also made from 100% wood pulp and are fully recyclable themselves, giving them excellent green credentials. This coloured tissue looks great, not only as a general wrapping product, but also as a filler in gift boxes and bags, or even in crafting projects. Our tissue paper is an effective and inexpensive way to create a striking unboxing experience, especially when using one of our Coloured Kraft Postal Boxes. Our bright new products are now live on the website to liven up your shopping!